It is a big deal! This pattern of drinking is when blood alcohol level (BAC) is up to .08 grams percent or more. For men, this usually happens when they drank 5 or more drinks, and women 4 or more drinks in approx. 2 hrs. And if you have an addictive personality you may be more likely to developing an addiction than your friends. Most of them are NOT alcoholics. Take this self-test and find out if you’re dependent. 70% of binging involves adults over 25 years, however college students do this behavior most often. If you think you have a problem with alcohol abuse or you can't stop binge drinking, you need help. Depending on the level of abuse here are treatment options Going to AA meetings and following the 12 steps of AA is helpful to stop binge drinking. Here are the steps to get you on track. Problem with drugs and your teenager? And if you or someone that you know has a drinking problem, there are many pages on this site that can help you. You can also get private help with coaching and a consultation. Find out what that's about. 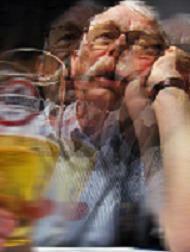 Are you enabling a binge drinker? Here are some tips to stop.